Paris, May 1940. In a country controlled by pro-nazi Vichy government, which has just signed an armistice with the Third Reich, who is at the gates of the city, a man whose apartment has just been registered by the authorities, flees to the south. 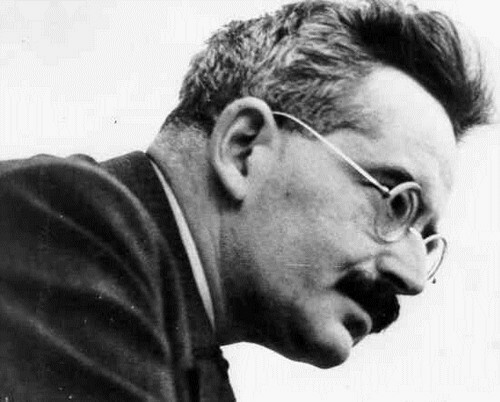 It is the Jewish German philosopher Walter Benjamin. Benjamin wants to flee to the United States, and, after passing through Lourdes, he arrives to Marseilles in September and meets his friends Hannah Arendt, Hans Arthur Koestler and Hans Fittko. It was no longer possible to ship from Marseille to America, so Hans gives Benjamin his sister address in Portvendres, France, to help him. The plan was to reach the new continent by boat starting from Portugal. Benjamin takes the advice and heads there by train, accompanied by the photographer Henny Gurland (who years later, in America, married Erich Fromm) and her son, Joseph. Finally we reached the top. I had moved on and I stopped to look. What I saw struck me as the result of a sort of hallucination: in an unexpected way I saw the sea back again, in a dark blue color. Portbou was down there. From there on they will descent to the village. Fittko leaves him and returns to the starting point, where in later years she will continue to guide many other exiles. Benjamin and his two companions arrive to the police station in Portbou, a border village with evident traces of a Civil War bombings which had ended only a year earlier. But Spanish police denied him entry into Spanish territory and announce that they will be handed over to French authorities. Controlled by police in the Hostal Francia, today closed, Benjamin spent his night in room number 3. After making a series of phone calls, he took a strong dose of morphine (which he got in Marseille), and his body is found the next morning on the bed. He died at 48 years. Walter Benjamin spent just over 12 hours of his life in the village of Portbou, but the mark it has left in it still remains indelible. In our next article we will discover how. It may be interesting to your customers this excerpt from my novel, “Walter Benjamin in intercity bus,” which takes place in the region that you are covering. Feel free to post the text that you send. Writer Vladimir M. is on the make-up exam: repair bugs that Davidovic underlay Vladan Petgrović. Cerbere. Hotel “Le Village des Aloes”. University Library in Perpignan. In the Year 2001. This already epochal escape and death. Vladimir, as a writer, he wants a little added up and subtracted. To analyze the stories, data, and legends. That takes advantage of the fame and avoids arbitrariness. In which almost everything known, only not sure if there was a famous letter, which is a woman with a child, who was with the writer in that escape, sent to Theodore Adorno, philosophy and anthropology. In America. Where are expecting Benjamin. It does not know or satellite. Vladimir tries to concentrate, to with own applied anthropology him call to mind colors, smells, emotions and drama of the past times this memorial destination. With the help of literary archeology, introduce yourself in the heart of the topic. What many advocates of conspiracy theories reduced to the uncertain fate of the writer’s lost briefcase? That sometimes its density becomes just physical, but also the intensity of colors: yellow, orange, violet, ultramarine, as I feel a touch of Matisse’s palette, but the craziness and the genius Dali surreal chaos that seemed to flow from the cold monumentality that scares me with a hole in consciousness. I feel it here, as if I’ve visited coming from neighboring Spain and darkness Benjamin Memorial. From Port Bou to which the German philosopher and critic went over the hill, underbrush, rocks and long ago heat of late summer. With a woman, photographer Henny Gurland, and her son Joseph. There is somewhere Fitko Lisa, also a leftist, organizer of Jews escapes through Spain to Portugal. In those days Walter climbed by goat trails on the slopes of the Pyrenees. At the beginning of the road was Marseilles, in which Walter arrived from Lourdes, where he spent a few spring weeks. 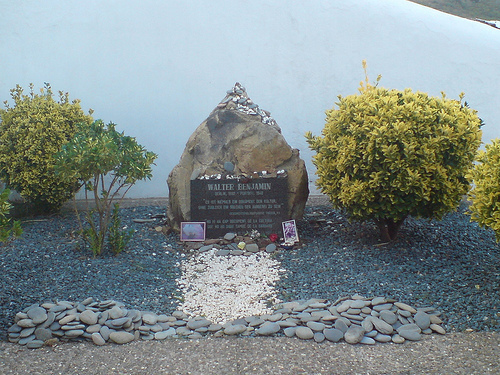 Following her sister Dora, which this shrine obviously helped, because she had lived up to in 1946. I read all this in the University Library in Perpignan, where I arrived the next day, as recommended by an elderly gentleman, our, Banat Romanians, a former professor of teacher training colleges in Vrsac, with whom I get to know the first night upon arrival in Cerbere, at the bar in a cafe across the street “Hotel La Vigie”, in the 3rd route d’Espagne. Florian did not share my obsession with Benjamin, but was very informed about everything that is here on the Riviera was important. For the third consecutive year, he has spent summer vacations at the nearby Port Vender. Even a rental car the next morning, he went with me to Perpignan. To help me in search of facts. He told me that at one time thought of South America, taken and movies of Benjamin. He tells me, to my great surprise that he himself criticized Benjamin what his philosophy often contains contradictory elements of rational and transcendent. At that moment, but later, Vladimir is not clear to what Professor thoughts. However, concluded that this was not sincere when he introduced himself as someone who is not enough to matter. Now, we are in Perpignan. We sit in the library club, buffet, on tables are unnaturally green tablecloths. Coffee is from pressure apparatus. The fan, it seems unnaturally large, buzzing and we are waiting for an Elena a librarian. By Florian knows because she is a Romanian. However, she was the origins of Brasov. Again a librarian. As then, when I in the village Ecka asked Arsene Colak, and came to counterpart Brujić – recalls Miroslav. Appeared and Elena, introduced herself as Ellen Hall. For the librarian too tanned and muscular. Strong legs and shoulders. While we offered lemonade and briefed about my plans, she told us that she works weekends as a tour guide in Banyuls-sur-Mer. Take curious people along the route of Benjamin’s attempt to escape the Nazis! Which is not surprising Florian, but he just shook me. In Perpignan, I first, find a source that would know all about the last days of my heroes! While we are alive and eagerly discussed, begin the club and continued at a cafeteria in a part of town rises to hill, in café “Les Antiquaires”, full of greenery, white tablecloths and brown-yellow walls and ceilings, Elena, with the feeling that tells something unusual, pronounced as Henny Gurland, who, with Benjamin was almost to his last breath, after a certain time, as though she got hold of America, became the wife of Erich Fromm! My exultation about new data was not the end, I could still only indirectly tell her, because my French was not sufficient even to order at the bar. After dinner, which was a Spanish-French-Basque, interrupt conversation to tomorrow? Elena goes home. With her husband, an Englishman. We travel back in Cerbere. With the car. Almost two hours driving. Because we has chosen to go over the old local road. First, by the sea. Then, serpentine. At a crossroads read: Andorra La Vella 86 km. I am tempted to persuade Florian to draw there. That live look at the town he lived in my main character – Davidovic. However, that night we returned to Cerbere. Do we turn around, who knows what I discovered about Senor Davidovik! In the morning, again Perpignan. Now I’m already better prepared. In this city, and continue the story. The first statement is confusing. People speak French, Basque, Corsican and Breton. Intoxicating range of languages. His hundred thousand people, probably strangers lead in state of linguistic signs! Ingrown in the area between the Mediterranean and the Pyrenees, all in gradients, full of palm trees and plane trees, and a fountain with mountain water. And, palace, trade names, dances and songs – breathe with Catalonia. Town of fabulous beauty! A city full of sun and greenery. The movable holiday in the Mediterranean. No wonder the surrealist Salvador Dali called Perpignan “center of the world.” My theme is, however, a German. 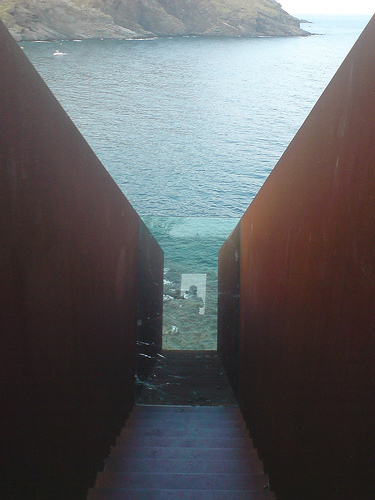 Walter Benjamin, who in escape through this natural and architectural beauty thought only of saving lives. I’m not sure that he anything about the environment observed. Elena was accurate. However, dressed differently than yesterday. In white and rosy dressed. Tanner, acquired probably during walking trails of refugees, it is very noticeable. Hardly discreet makeup and fragrance. Finally, there is a part of her story about Benjamin’s last hours. We’re back in the club. We drink sangria, Elena – Coca-Cola. The story of the days of September in 1940 begins by mentioning the two women’s names. One was Henny Gurland. She with Benjamin reached the place Port Bou. Of the representatives of the authorities found out that Walter has no valid documents. Expired his German citizenship and the French did not receive. Shock. Disaster. As it is occurred end of the World. A similar fate apparently awaits her son Joseph. Even he does not have valid documents. However, the little person is not interested Germans. Neither resident’s collaborators. Benjamin, however, at the end of her life’s journey. Return to the camp is out of question. Years ago, when he was in Nice in the former communists, mystic and positivist at the same time, predicted suicide as a way out of life-saving potential of living impasse. Before the morphine overdose, or so he testified Henny, in a later letter to Adorno, who was awaiting him. In New York. He asked this young woman, the latter known photographer, the contents of the letters memorize and then destroy the letter. Thus, everything based only on the testimony of Henny Gurland, on her honesty, and faith in her sincerity. And honesty. While the one Benjamin’s suicide note remained undestroyed. Moreover, forwarded. This message intended for some Catholic convent in Spain. Thus, she testified about everything. We then stopped working for a while, while Ellen performed their duties in the University Library. For this, we have time, Florian and I ran through catalogs and informers, at lunch in the cafeteria. That was actually the name of “La Court restaurant 66″, in an environment of cross-tradition, which was the Spanish and French. Building with a lot of blue in exterior and a moderate interior kitsch. During lunch, he played with guitar local artist Jerome. Then followed the story of another woman from the saga of Walter’s tragic end. Elena had taught us, with a touch of professional indifference, as some European of Lisa Fittko, later American, journalist and writer, was one of the organizers of the effort to save the French scientists and artists, mostly of Jewish origin. They were trying somehow to arrive to Lisbon, where they intended to get by boat to America. With Benjamin’s group and she reached the place Port Bou. And was obviously less familiar with Walter than young Henny, because he is still this, Gurland, dictated his last letter, so Fittko not know details about the writer’s last hours of this writer, but remember Benjamin’s briefcase, from which the writer, and in addition to its substantial weight, not parted. In the bag were some literary manuscripts. Allegedly work that he had begun writing a few months before trying to escape. More in Marseilles and Lourdes. Madam Fittko testifies unequivocally that the briefcase not found after Benjamin’s death. She not listed on the police found property in the room Hotel “France”. Elena goes on to say, how Henny Gurland purse first not mentioned, then that subject as he remembers through the fog, and finally assumed that it was irrelevant to Benjamin. Or too important, and the same is he himself destroyed. Wrapping up this story, Elena says that Mrs Fittko, later very prominent in the United States, repeatedly returning to Port Bou, Cerbere and Banyuls-sur-mer, in order to found the famous briefcase. However, it was not. Only the pipe, round glasses and a couple of trivial little thing waiting for the police depot heirs, or some interested Museum. Mrs. Hall was about, was much extensive. Even we suggested, addressing more Florian, which is the whole thing, however, less interested, but he knew Romanian, there are still some rumors and theories about the true version of Benjamin’s death. What I initially stated. I’m just not able to receive more information. I asked, to the separation with Elena, it is no coincidence Walter wrote a farewell letter to Asja Lacis? To that, has librarian responded to the issue – and by that Asja Lacis? My attachment to the romance of Benjamin’s life was thus violated. Probably no reason. I misplaced, because the romance Walter and Asja long since ceased. In the whirlwind of Nazism, Communism, literature and Brechtian theater, which is devotee, was Lacis. Which was also a very ambitious woman? Who knew how with men. While to them do the same with her did not work. My trip to the Pyrenees and the ocean was ending. That’s why I stayed in it for one more night – Vladimir Miroslav ends the first part of his diary from the south of Europe. Aware that filling part of the void Benjamin’s life, at the same time opens up new mysteries. That would remain irrelevant that the previous not deciphered … So, continue to swirl that fascinates. From France I went to the famous tourist region of Costa Brava, with the intention to visit three cultural destination. Of course, to enjoy in the local recognized cuisine and beautiful beaches.From the many “wonders of the world”, which is abundant in Spain I decided that this time tour the small town of Portbou, where it is ended the life of the famous German literary theorist Walter Benjamin, that in Figueres visit the Salvador Dali Museum, and in Barcelona to look around the famous, controversial and fascinating Sagrada Famillia. When the train, local, at a speed of only 40 km going through a tunnel leading through the Pyrenean massif, leaving Cerbère, the morning was fresh and the sky so blue as the expression that it is Henri Matisse during the night painted. In Portbou I primarily came to experience it as directly as the place where is mine literary themes from previous years, essayist and philosopher Walter Benjamin, 1940. ended his life. From the train station, that was built very monumental yet for the World Exhibition in Barcelona in 1929, I coming down in town. Summer is already at an end, however, this town still lives an intense tourist life. A morning already flows into the midday lunch break. Restaurants, which are lined up along the Gulf protected coastal parts, slowly filled. Mediterranean buzz online smallish space between the sea and the bare, reddish-yellow hills that surround the city. it less felt gust of wind, which on that day was blowing along the Costa Brava. Restaurant “Passatges” is a modest but tucked away and has an intimate space. The staff is warm, spontaneous and somewhat relaxed, but the atmosphere is very positive and Mediterranean cheerful. While outside, especially in the Gulf, preparing summer storm, a pleasant relaxed we ordering lunch.. I know that the unique location of the area Costa Brava, between – in Spanish, the “mar and muntanya” (or in English – sea and mountain) has lead to a cuisine with an individual blend of flavors and textures. That’s why I said proper meals. First, as an appetizer arrives “Patatas bravas”, possibly the best-loved dish of the region, actually potato wedges in a spicy tomato sauce. After a short break, bring us “Suquet de peix” representing a tasty fish stew, which is served with potatoes. As a “amplification” we ordered andabundant portion involving mushrooms (locals say” setas “), which are taken from the surrounding mountains. For dessert, it was quite the associated since we are in Catalonia, there’s only one thing you should be tasting for dessert – Crema Catalana! This tasty pudding closely resembles its French cousin, crème brûlée. Bearing in mind the kind of food we ate in the restaurant “Passatges” we drank white wine “Moscatel”. In quite a pleasant mood we waited for the summer storm calms down, and we can then make a tour of the city’s memories of Walter Benjamin. It is logical to start tour with Hotel “France”, in where is before more than seventy years, died this important European leftist and art theoretician. However, we can only conclude that this hotel is no longer there! The building is still at the same place, in the street in the center of this tourist small town, but its facade and purposes completely changed. Now it’s a shop. There is only a small and inconspicuous memorial plaque with meager notice of the ancient tragic event. Quite surprised and disappointed with colleagues we go to the local cemetery where was buried Walter Benjamin in 1940. After a short stay, I go to the memorial complex, designed by artist, Dani Karavan. It is an impressive memorial complex called GATE, as a symbol of what Walter Benjamin could not find in life and escape – exit to freedom!. of the tunnel. In contrast to the azure sea and green environment, cause an impression of existential dread.